ACDelco Oil Filters provide the first line of defence from harmful contaminants that can seriously degrade engine performance and lifespan. The advanced ACDelco Duraguard® Oil Filter design traps harmful microscopic contaminants. 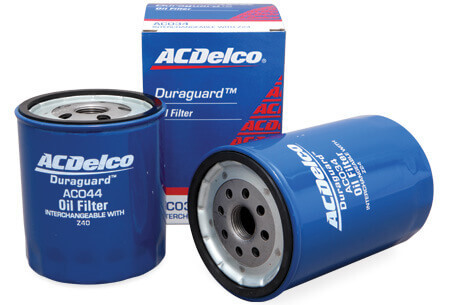 ACDelco Duraguard® Filters are designed to have high efficiency capabilities throughout the life of the filter. The cellulose and synthetic fibres used in Duraguard® Oil Filters can trap virtually all contaminants larger than 25 microns (smaller than a third of a human hair).